Kamala “Ms. Marvel” Khan loves writing fanfiction, but now that she’s a superhero herself, she finds herself cast as a major character in other users’ imaginary narratives. These fanfictions make up the majority of the content in next week’s All-New, All-Different Avengers Annual #1, featuring an exciting lineup of creators teaming up to tell short stories starring Avengers characters. Mark Waid and Chip Zdarsky tackle Captain Marvel, Natasha Allegri details She-Hulk’s adventures, and Zac Gorman, Jay Fosgitt, Faith Erin Hicks, and Scott Kurtz all contribute stories starring Kamala, including a showdown with Squirrel Girl. Ms. Marvel writer G. Willow Wilson is the perfect choice to handle the framing sequence shown in these preview pages, and her understanding of Kamala’s voice and the community’s reaction to Ms. Marvel makes for an immediately engaging entryway into this collection of shorts. 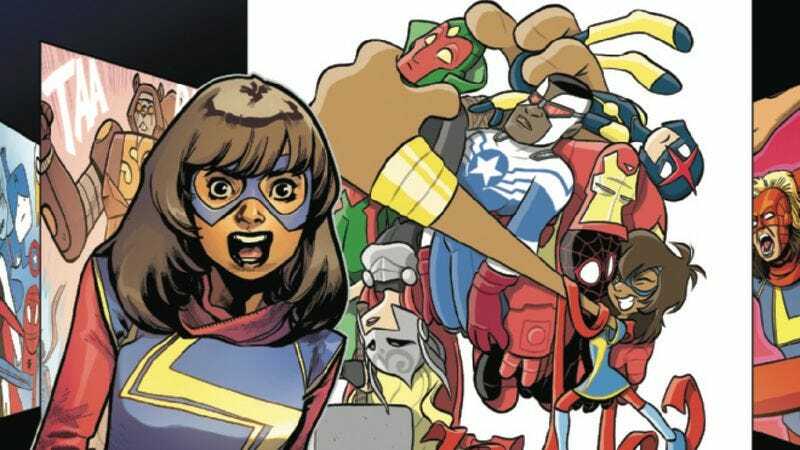 All-New, All-Different Avengers artist Mahmud Asrar accentuates Kamala’s youth in these pages, and colorist Tamra Bonvillain’s smooth rendering brings extra dimension to the linework. This framing sequence isn’t the big attraction, but if all the fanfiction stories maintain that level of quality, All-New, All-Different Avengers Annual should prove to be a very entertaining one-shot.